Big News! Opti-Cool HeadGear Now Officially Uses Emojis! Who doesn’t use Emoji’s nowadays while texting, chatting and communicating with each other to save time, instead of texting something that an emoji can summarize it with an icon character? Kids and adults love them, and especially when you can have them in other items besides your communication devices. Opti-Cool Headgear is excited to announce to our clients that the Emoji characters can be printed on any of our custom protective helmets. The only thing you need to do is choose the color helmet and select any of the Emoji graphic decal designs that we offer for printing. As we do with other of our custom design orders, you will have the option to select a different color helmet to match. We carry black, blue and purple helmets and based on your specifications and needs you can also add to your order the cooling elements that include inner cooling gel packs. 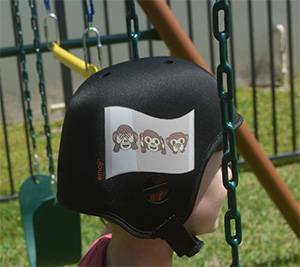 Our versatile Opti-Cool Helmets have anything your child needs for preventative care for various types of special needs. Its great characteristics include, extreme comfort, very lightweight, moisture wicking material, quality chin guard, stylish design, customizable, and most of all, excellent protection. Adults can also benefit from them for surgery recovery purposes and protection. Opti-Cool Headgear is a Florida based company making a difference in helping people with the need for head injury protection. Our lineup of designs can be ordered on the phone now and will be added to the website in the next few weeks. Be the first to own the official Emoji helmet! Don’t forget, if you have any further questions please give us a call at (866) 903-2568 or click HERE to contact us by email.